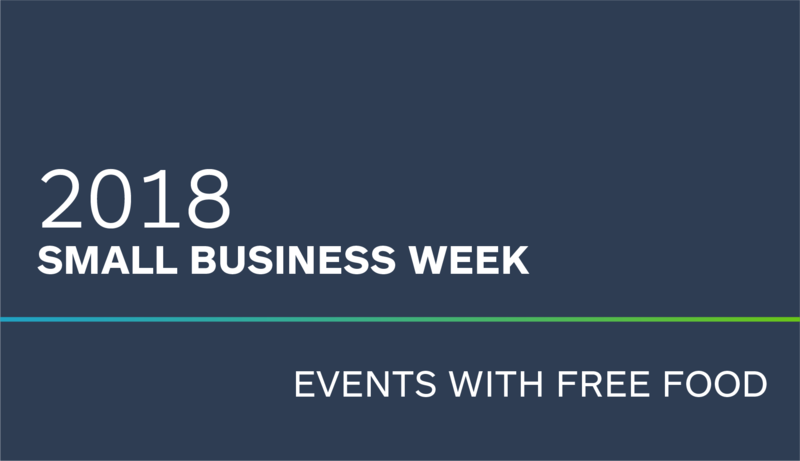 National Small Business Week 2018 is next week, April 29 – May 5! Learning, networking, and growing as a professional are great and all, but we all know the real reason why we’re at those small business week events: the free food. Fine, maybe it’s just me, but food simply tastes better when it’s free. We sorted through the many local events for Small Business Week in the U.S., and made sure to share the good stuff (read: yummy and affordable). All jokes aside, there are so many great local Small Business Week events to bring business owners and employees together. If you can’t find a local event below, you can look for events through your local Small Business Association website or check out Eventbrite and your local newspaper for listings. Without further ado, here’s a sampling of events for National Small Business Week that are providing some bites for business owners. Start your Monday morning out right, learning how tech can improve your small business, side hustle, or startup. Owning a small business isn’t easy and can sometimes feel lonely as you face challenges. The East Central Indiana SBDC is offering coffee and encouragement during Small Business Week. Savory status: Great. C’mon, it’s coffee! Mr. Eric G. Knowles of the Miami-Dade Chamber of Commerce will be speaking on business leadership, plus a meet-and-greet with The Office of Economic Opportunity. Savory status: Five stars for doughnuts. You can expect a panel discussion from the State of Illinois Business Enterprise Program (BEP) about the opportunities for healthcare and IT industries. You can take advantage of access to capital, L.A. City Small Business resources, workshops, and certification assistance. Join Build Institute, the Small Business Association, and the USPS for a workshop on how direct mail works in today’s marketplace and why it should be in your marketing mix. And, there’s more great events at the link above. Sameka Jenkins of Carolima’s Lowcountry Cuisine and Emma Cromedy of SouthernCakeQueen will share information to help you start your business or grow your existing business. The California Asian Pacific Chamber of Commerce is bringing together experts from PEREZ APC, the Small Business Administration, and Jack Novicio Insurance to share advice on how to conduct business overseas and secure funding and bonding for international projects. Decide DeKalb Development Authority and the DeKalb Chamber will host a film screening of the documentary Dream, Girl, a powerful film about inspiring and ambitious entrepreneurs sharing their stories on what it means to be a woman, a leader, and a dream chaser. There’s also a panel of seasoned business owners to empower the spirit of entrepreneurialism. Savory status: Complimentary wine and movie theater popcorn for $10? I’m here for it. A reception with light fare and drinks to bring together and support local small business owners while enjoying food and conversation. Savory status: Sounds like my kind of party! The Talk will feature experienced business owners of color and their unique journey in entrepreneurship while overcoming barriers. In addition, there will be a panel discussion and a chance for attendees to connect with key business resources in the community. Savory status: Pleased. “Light refreshments will be provided”. Make sure to mark your calendars for the Small Business Week events in your area. It’s a great time to celebrate all of your hard work as a company and get inspired as a business owner or employee. Have more Small Business Week events you want to add to the list? Get in touch at outreach@goshippo.com.